Aglime – For Your Soil’s Health – L.R. Falk Construction Co.
LR Falk Construction provides delivery and spreading of Ag Lime products for your agricultural needs. For aglime quotes and spreading availability please contact us. The average annual yield increases about 4.3 bushels per acre. On 320 acres that translates into 1,376 additional bushels per year. 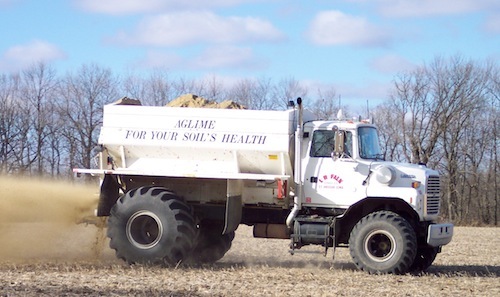 Many clay soils, when liming regularly, become more porous and allows rain to drain away quicker, allowing you to get on to the ground earlier in the spring. Soil environment becomes less hospitable for many beneficial microorganisms that contribute to good soil tilth as acidity problems become more severe. With improved soil tilth, plant roots can “grow” to available moisture more easily. Some types of herbicides are less effective as soil acidity becomes more severe. You must use increasingly higher application rates to achieve desired weed control. Correcting soil acidity problems will allow you to reduce the amount of these herbicides used, which will allow you to lower your production costs. Acidity makes the soil environment less favorable for many beneficial organisms, it becomes more favorable for others. Disease organisms, e.g. verticillium wilt, do not do as well with higher pH soils. When soil becomes more acidic you have a greater risk for a crop disease outbreak. With soil acidity corrected you don’t have to apply extra crop nutrients or herbicides to compensate for reduced effectiveness. For more information about our Aglime services please contact us.